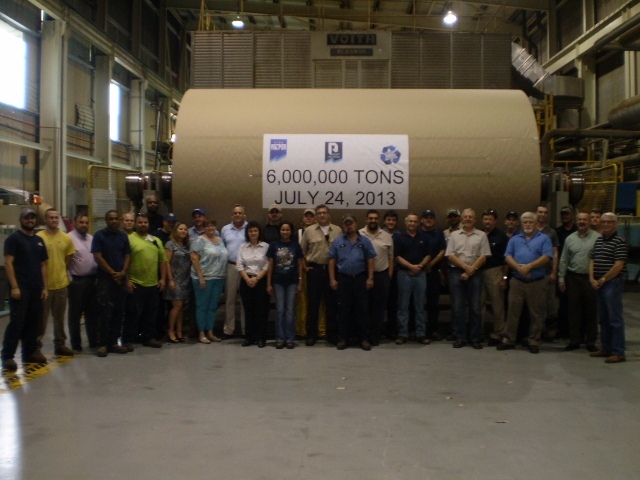 The team at Conyers celebrate the making of the mill's 6 millionth ton of 100% recycled paper. Pratt Industries has just celebrated another major milestone – its Conyers mill has produced its 6 millionth ton of 100% recycled paper. The Conyers facility, the first Pratt-built mill in the USA, reached the landmark number on July 24th – 18 years after start-up. Ironically, the 6 millionth ton was 26-pound – as was the first ton back in 1995. Since then, the mill has saved the equivalent of more than 100 million trees and prevented 480 million truck loads of discarded paper from possibly going to landfill. Pratt CEO Brian McPheely extended a company-wide “well done” to the Conyers team. Mill manager Allen Bowdler echoed those sentiments, saying the milestone was a tribute to hard work and dedication. Just a month ago, Conyers’ sister mill in New York City celebrated the production of its 5 millionth ton.